Let’s take a look first and understand how the flow of information gets sent to the visiting user without a child theme. The visitor uses their browser and contacts the WordPress CMS to request the page they want to view, WordPress then talks to the theme. The theme grabs the comic image necessary and it all then is compiled out to the visitor. 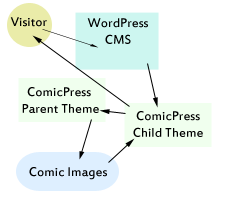 With ComicPress 2.9 we have introduced another step in the process called a “Child Theme” a child theme is pretty much just like a regular theme but the core code execution on how the theme behaves is handled by the parent theme, in this case the ComicPress theme. 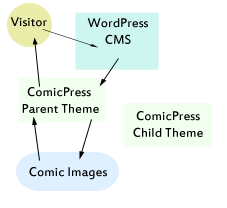 The visitor uses their browser and contacts the WordPress CMS to request the page they want to view, wordpress them talks to the Child Theme which utilizes the code from the parent theme which grabs the comic image and then outputs the design style of what the child theme has out to the visitor. This allows the site designer to create their own theme which uses the ComicPress core functions without modifying or editing the original ComicPress theme. Yes, like Companion, however with the added bonus that whatever files you have in the child theme will override any from the original theme. This also allows us to provide distributable theme designs that utilize the ComicPress core functions without the core, allowing us to provide the users of ComicPress with a variety of different layouts and designs that can be utilized as base designs to start from. Cool! I’ve used Child themes before with other themes so I’m excited to hear I’ll be able to use them with Comicpress. Any idea when 2.9 will be coming out? I was going to try to upgrade to 2.8 but if 2.9 is coming out soon anyway then I might as well not bother. Just stumbled onto this post through a Google search and wanted to say that I’m really happy to see ComicPress embracing child themes. I’ve been using a child theme with ComicPress for a year now and its nice to know that method is going to be officially supported. Companion is a nice idea, but I think a lot of users are going to find it much easier to simply plug in their customizations of ComicPress through a child theme. Great work! I just finished creating my basic site with WordPress and Comicpress. Can I just purchase one of these child themes and install it onto the existing site? Or does this mean I will have to start over? I’m totally eyeballing the Spacecase theme for my sci-fi site. Heya Rob! .. wierdly enough I read your comic today. Unfortunately these child themes only work with comicpress 2.9 not 2.8, however if you did purchase it you should be able to get a download link from one of the menu’s to download the zip file for it to put on your machine. .. and we havent released 2.9 yet to the public. If you didn’t contact me and I can help you set it all up.